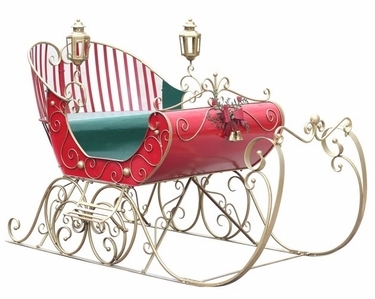 Home > Holiday Specials > Large Victorian Christmas Sleigh "LUCIANA"
A truly magnificent Christmas Sleigh, this Large Victorian Christmas Sleigh will drop jaws, literally it will! A gorgeous piece built extra sturdy and intended for both indoor and outdoor display use. Holiday reds & greens adorned with exquisitely elegant golden scroll work with plenty of room inside for presents and even that perfect holiday photo. Stands 80" Long x 39" Wide x 47" High. Weight: 136 lbs.